"Modulating" redirects here. For other uses, see Modulation (disambiguation). Key signature change example: C major to C minor. In music, modulation is the change from one key (tonic, or tonal center) to another. This may or may not be accompanied by a change in key signature. Modulations articulate or create the structure or form of many pieces, as well as add interest. Treatment of a chord as the tonic for less than a phrase is considered tonicization. Modulation is the essential part of the art. Without it there is little music, for a piece derives its true beauty not from the large number of fixed modes which it embraces but rather from the subtle fabric of its modulation. The quasi-tonic is the tonic of the new key established by the modulation. The modulating dominant is the dominant of the quasi-tonic. The pivot chord is a predominant to the modulating dominant and a chord common to both the keys of the tonic and the quasi-tonic. For example, in a modulation to the dominant, ii/V–V/V–V could be a pivot chord, modulating dominant, and quasi-tonic. Common-chord modulation (also known as diatonic-pivot-chord modulation) moves from the original key to the destination key (usually a closely related key) by way of a chord both keys share: "Most modulations are made smoother by using one or more chords that are common to both keys." For example, G major and D major have four chords in common: G major, B minor, D major and E minor. This can be easily determined by a chart similar to the one below, which compares triad qualities. The I chord in G major—a G major chord—is also the IV chord in D major, so I in G major and IV in D major are aligned on the chart. Any chord with the same root note and chord quality (major, minor, diminished) can be used as the pivot chord. However, chords that are not generally found in the style of the piece (for example, major VII chords in a J. S. Bach-style chorale) are also not likely to be chosen as the pivot chord. The most common pivot chords are the predominant chords (ii and IV) in the new key. In analysis of a piece that uses this style of modulation, the common chord is labeled with its function in both the original and the destination keys, as it can be heard either way. Where an altered chord is used as a pivot chord in either the old or new key (or both), this would be referred to as altered common chord modulation, in order to distinguish the chromaticism that would be introduced from the otherwise, diatonic method. An enharmonic modulation takes place when one treats a chord as if it were spelled enharmonically as a functional chord in the destination key, and then proceeds in the destination key. There are two main types of enharmonic modulations: dominant seventh/augmented sixth, and (fully) diminished seventh. Any dominant seventh or German sixth can be reinterpreted as the other by respelling the m7 or A6 chord tone (respectively) in order to modulate to a key a half-step away (descending or ascending); if the fifth from root chord tone of a German sixth is omitted, the result is an Italian sixth. A diminished seventh chord meanwhile, can be respelled in multiple other ways to form a diminished seventh chord in a key a minor third (m3 as root), tritone (d5 as root) or major sixth (d7 as root) away. Where the dominant seventh is found in all diatonic scales, the diminished seventh is found only in the harmonic scale naturally; an augmented sixth is itself an altered chord, relying on the raised fourth scale degree. C♯–E–G–B♭ (dim. 7th), C–E–G–B♭ (lowering the root a semitone to a modulating dom. 7th), F–A–C (quasi-tonic) takes us to F major—a relative major modulation (though not enharmonic); but exactly the same progression enharmonically C♯–E–G–B♭, C–E–G–A♯ (Ger. aug. 6th), E–G–B–E (quasi-tonic) takes us somewhat unexpectedly to E natural/harmonic minor—a half-step modulation (ascending). C♯–E–G–B♭ (dim. 7th), A–C♯–E–G (lowering the 7th a semitone and respelling as a modulating dom. 7th), D–F♯–A (quasi-tonic) takes us to the key of D major—a parallel modulation (though not enharmonic). Enharmonically: C♯–E–G–B♭, A–C♯–E–F (Ger. 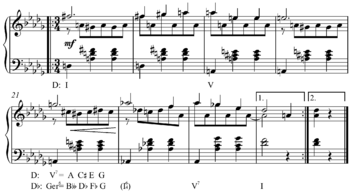 aug. 6th), C♯–E–G♯ (quasi-tonic) modulates to C♯ minor—a major seventh modulation/half-step descending. C♯–E–G–B♭ (dim. 7th), C♯–E♭–G–B♭ ≡ E♭–G–B♭–D♭ (lowering the major third a half tone and respelling as a modulating dom. 7th), A♭–C–E♭ (quasi-tonic) leads to A♭ major—a minor third and relative modulation (or tritone modulation if starting in D Major). Note that in standard voice leading practice, any type of augmented sixth chord favours a resolution to the dominant chord (see: augmented sixth chord), with the exception of the German sixth, where it is difficult to avoid incurring parallel fifths; to prevent this, a cadential six four is commonly introduced before the dominant chord (which would then typically resolve to the tonic to establish tonality in the new key), or an Italian/French sixth is used instead. In short, lowering any note of a diminished seventh chord a half tone leads to a dominant seventh chord (or German sixth enharmonically), the lowered note being the root of the new chord. Raising any note of a diminished seventh chord a half tone leads to a half-diminished seventh chord, the root of which is a whole step above the raised note. This means that any diminished chord can be modulated to eight different chords by simply lowering or raising any of its notes. If also employing enharmonic respelling of the diminished seventh chord, such as that beginning the modulation in the above examples (allowing for three other possible diminished seventh chords in other keys), it quickly becomes apparent the versatility of this combination technique and the wide range of available options in key modulation. This type of modulation is particularly common in Romantic music, in which chromaticism rose to prominence. Other types of enharmonic modulation include the augmented triad (III+) and French sixth (Fr+6). Augmented triad modulation occurs in the same fashion as the diminished seventh, that is, to modulate to another augmented triad in a key: a major third (M3 as root) or minor sixth (A5 as root) away. French augmented sixth (Fr+6) modulation is achieved similarly but by respelling both notes of either the top or bottom major third (i.e. root and major third or diminished fifth and augmented sixth) enharmonically and inverting with the other major third (i.e. diminished fifth and augmented sixth becomes root and major third of the new Fr+6); either choice results in the same chord and key modulation (a tritone away), as the diminished fifth always becomes the new root. Common-tone modulation uses a sustained or repeated pitch from the old key as a bridge between it and the new key (common tone). Usually, this pitch will be held alone before the music continues in the new key. For example, a held F from a section in B♭ major could be used to transition to F major. This is used, for example, in Schubert's Unfinished Symphony. "If all of the notes in the chord are common to both scales (major or minor), then we call it a common chord modulation. If only one or two of the notes are common, then we call it common tone modulation." Starting from a major chord, for example G major (G–B–D), there are twelve potential goals using a common-tone modulation: G minor, G♯ minor, B♭ major, B major, B minor, C major, C minor, D minor, D major, E♭ major, E major, E minor. Thus common-tone modulations are convenient for modulation by diatonic or chromatic third. Chromatic modulation in Bach's Du grosser Schmerzensmann, BWV 300, mm. 5–6 ( Play (help·info) with half cadence, Play (help·info) with PAC) transitions from F major to D minor through the inflection of C♮ to C♯ between the second and third chords. Note that there is no common chord. In this case, the IV chord in C major (F major) would be spelled F–A–C, the V/ii chord in C major (A major) spelled A–C♯–E, and the ii chord in C major (D minor), D–F–A. Thus the chromaticism, C–C♯–D, along the three chords; this could easily be part-written so those notes all occurred in one voice. Despite the common chord (ii in C major or i in D minor), this modulation is chromatic due to this inflection. In this case, the V chord in F major (C major) would be spelled C–E–G, the V in D minor (A major) would be spelled A–C♯–E. Thus the chromaticism, C–C♯–D, which is here split between voices but may often easily be part-written so that all three notes occur in one voice. The combination of chromatic modulation with enharmonic modulation in late Romantic music led to extremely complex progressions in the music of such composers as César Franck, in which two or three key shifts may occur in the space of a single bar, each phrase ends in a key harmonically remote from its beginning, and great dramatic tension is built while all sense of underlying tonality is temporarily in abeyance. Good examples are to be found in the opening of his Symphony in D minor, of which he himself said (see Wikiquote) "I dared much, but the next time, you will see, I will dare even more..."; and his Trois Chorals for organ, especially the first and third of these, indeed fulfill that promise. Phrase (also called direct, static, or abrupt) modulation is a modulation in which one phrase ends with a cadence in the original key, and begins the next phrase in the destination key without any transition material linking the two keys. This type of modulation is frequently done to a closely related key—particularly the dominant or the relative major/minor key. An unprepared modulation is a modulation "without any harmonic bridge", characteristic of impressionism. "A passage in a given key ending in a cadence might be followed by the same passage transposed (up or down) to another key," this being known as sequential modulation. Although a sequence does not have to modulate, it is also possible to modulate by way of a sequence. A sequential modulation is also called rosalia. The sequential passage will begin in the home key, and may move either diatonically or chromatically. Harmonic function is generally disregarded in a sequence, or, at least, it is far less important than the sequential motion. For this reason, a sequence may end at a point that suggests a different tonality than the home key, and the composition may continue naturally in that key. A parallel key modulation is a change of mode, but maintains the same tonal center. For example, one section of a composition may be in the key of E major and then modulate to E minor. This can be done directly or facilitated by the various modulation techniques described above. Depending on the length of the modulation and whether or not it returns to the original key, it may or may not be designated by a change of key signature. From G (which is the given key), a musician would go P5 (a perfect fifth) above G (which is D) and also P5 below G (which is C). From this, the musician would go to G major's relative minor which is E minor, and potentially to C major and D major's related minor as well (a musician who does not know the related minor for C and D major may also go P5 below or above E minor). By using the relative minor keys one can find the specific key that the key can modulate into. 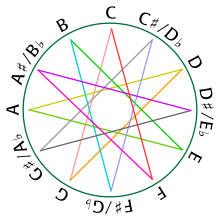 Many musicians use the circle of fifths to find these keys and make similar charts to help with the modulation. In certain classical music forms, a modulation can have structural significance. In sonata form, for example, a modulation separates the first subject from the second subject. Frequent changes of key characterize the development section of sonatas. Moving to the subdominant is a standard practice in the trio section of a march in a major key, while a minor march will typically move to the relative major. Changes of key may also represent changes in mood. In many genres of music, moving from a lower key to a higher often indicates an increase in energy. Change of key is not possible in the full chromatic or the twelve tone technique, as the modulatory space is completely filled; i.e., if every pitch is equal and ubiquitous there is nowhere else to go. Thus other differentiating methods are used, most importantly ordering and permutation. However, certain pitch formations may be used as a "tonic" or home area. Though modulation generally refers to changes of key, any parameter may be modulated, particularly in music of the 20th and 21st century. Metric modulation (known also as tempo modulation) is the most common, while timbral modulation (gradual changes in tone color), and spatial modulation (changing the location from which sound occurs) are also used. Modulation may also occur from a single tonality to a polytonality, often by beginning with a duplicated tonic chord and modulating the chords in contrary motion until the desired polytonality is reached. Vincent Persichetti, Twentieth-Century Harmony. W.W. Norton and Company, 1961. ISBN 0-393-09539-8. ^ Boston Academy of Music, Lowell Mason (1836). The Boston Academy's Collection of Church Music, pp. 16–18. Fourth edition. J. H. Wilkins and R. B. Carter. ^ Forte, Allen (1979). Tonal Harmony in Concept & Practice, p. 265. ISBN 0-03-020756-8. ^ a b c Forte (1979), p. 267. ^ Benward and Saker (2009). Music in Theory and Practice, Vol. II, p. 214. ISBN 978-0-07-310188-0. ^ Forte (1979), p. 307. ^ Benward and Saker (2009), p. 244. ^ Forte (1979), p. 305. ^ Benward & Saker (2009), pp. 214–15. ^ Benward & Saker (2009), p.220. ^ "Enharmonic Reinterpretation" (PDF). Feezell, M. Retrieved 2016-04-05. ^ Meyer, Leonard B. (1989). Style and Music: Theory, History, and Ideology, p. 299. ISBN 9780226521527. ^ Kostka, Stefan and Payne, Dorothy (1995). Tonal Harmony, p. 321. McGraw-Hill. ISBN 0-07-035874-5. ^ Briggs, Kendall Durelle (2014). The Language and Materials of Music, p. 198. Lulu.com. ISBN 9781257996148. ^ Kopp, David (2006). Chromatic Transformations in Nineteenth-Century Music, p. 50. Cambridge University Press. ISBN 9780521028493. After Marx, Adolph Bernard. Theory and Practice (1837). Trans. Saroni. ^ a b c Benward and Saker (2003). Music: In Theory and Practice, Vol. I, p. 245. Seventh Edition. ISBN 978-0-07-294262-0. ^ Benward and Saker (2003), Vol. I, p. 244. ^ Reti, Rudolph (1978). Tonality, Atonality, Pantonality. Westport, CT: Greenwood Press. ISBN 0-313-20478-0. ^ a b Forte (1979), p.319. ^ Heussenstamm, George (2011). Hal Leonard Harmony & Theory – Part 2: Chromatic. ISBN 9781476841212. ^ Jones, George T. (1994). HarperCollins College Outline Music Theory, p. 217. ISBN 0-06-467168-2. ^ "Prelude to Musical Geometry", p. 364, Brian J. McCartin, The College Mathematics Journal, Vol. 29, No. 5 (Nov., 1998), pp. 354–70. (abstract) (JSTOR). ^ Benward & Saker (2003). Music: In Theory and Practice, Vol. I, p. 243. 7th edition. McGraw-Hill. ISBN 978-0-07-294262-0. "Most modulations occur between closely related keys, which are those keys that differ by no more than one accidental in the key signature." ^ Forte (1979), p. 269.